Manchester United received yet another blow to their top 4 aspirations on Saturday, as they scraped up a 2-2 draw against Southampton at the St Marys. The Red Devils looked set to face yet another embarrassing defeat, but were saved by goals from Romelu Lukaku, who finally ended his long-standing goal drought, and midfielder Ander Herrera. While Lukaku’s goal, along with the comeback-inspiring performance of Marcus Rashford, were big positives for the Mancunians on the night, a fair share of negatives were also on display. 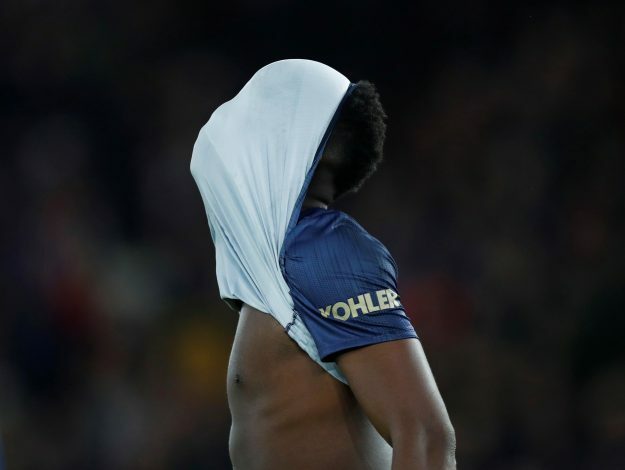 Star midfielder Paul Pogba was one of the worst performers on the pitch, if not the worst, with his display attracting criticism from the manager, fans, and pundits alike. The Frenchman failed to complete less than 85 percent of his passes, lost 15 of the 30 duels he attempted, and was dispossessed 8 times throughout the game. Jose Mourinho even highlighted the midfielder’s flawed antics during his post-match interview, labeling poor passing and ball retention as the primary reason behind the unfavourable result. Further, in the dressing room after the match, the Portuguese reportedly called Pogba a “virus,” as the former Juventus man not only failed to do his own job, but also got in the way of his fellow teammates, preventing them from doing theirs. But if Mourinho’s tremendous frustration with the World Cup winner isn’t evident through his words, perhaps this clip of his reaction could fill you in. During the 82nd minute, BT Sport decided to have a little ‘Manager Cam,’ which incidentally happened to catch Jose’s reaction when Pogba lost the possession rather stupidly yet again.